The "Interactive" sheet is the main sheet. 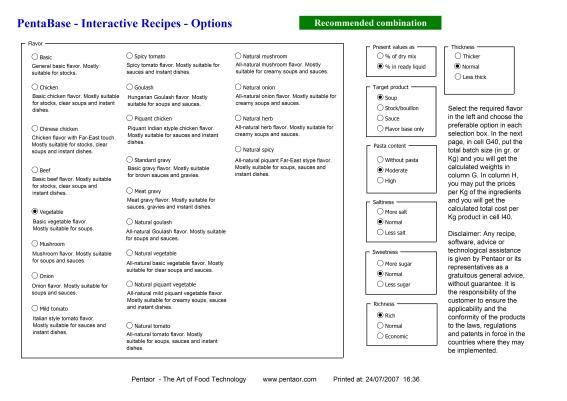 The "Free Recipe Template" sheet is a formula template that you may freely enter any recipe modification that you wish. In the "Interactive" sheet, in the first page, you first have to choose the required flavor. You have to choose whether the values in the recipe will be as % of the total dry mix or as % of the final ready wet soup/bouillon/sauce. If you choose % of the dry mix, in the very bottom of the recipe you will get the recommended powder:water proportion. You have to choose whether your final product is going to be a soup, stock/bouillon, sauce or flavor base only (only the ingredients contributing to the flavor characteristics without anything else). In applications that are supposed to contain pasta, you can "play" with the pasta content. For applications that are not supposed to contain pasta (like sauces), it's irrelevant. You may make the product more or less salty. You may make the product more or less sweet. If an extremely rich product is required, choose "Rich". If the costing is too high, choose "Economic". You may adjust the thickness of the product. In the second page (i.e., in the calculated recipe itself), put in cell G40 the batch size in the trial that you would like to do and in column H.
You may also enter the costing of each ingredient, yielding in cell I40 the final ingredient cost per Kg powder or per Kg liquid (depends whether you chose to make the calculation as % of powder or as % of the total ready liquid). Disclaimer: Any formula, advice or technological assistance is given by Pentaor or its representatives as a gratuitous general advice, to be examined and approved by the customer. It is also the responsibility of the customer to ensure the conformity of the products to the laws, regulations and patents in force in the countries where they may be implemented.